Axelrod, Alan, Lincoln's Last Night : Abraham Licoln, John Wilkes Booth, and the Last Thirty-Six Hours Before the Assassination, (Chamberlain Brothers, 2005). Good, Timothy S., editor We Saw Lincoln Shot: One Hundred Eyewitness Accounts, (University of Mississippi Press, 1995). Goodrich, Thomas, The Darkest Dawn: Lincoln, Booth, and the Great American Tragedy, (Indiana University Press, 2005). Hanchett, William, The Lincoln Murder Conspiracies, (University of Illinois Press, 1986). 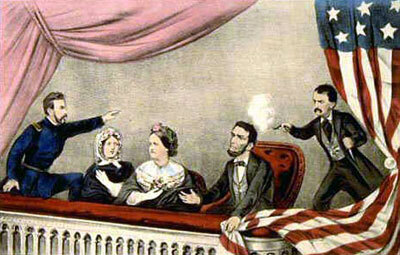 Holzer, Harold, The President is Shot: The Assassination of Abraham Lincoln, (Boyds Mill Press, 2003). Holzer, Harold and Williams, Frank, Lincoln's Deathbed in Art and Memory: The "Rubber Room" Phenomenon, (Thomas Publications, 1998). Dorothy Meserve Kunhardt and Philip B. Kunhardt, Jr., Twenty Days, (Book Sales, 1994). Leonard, Elizabeth D., Lincoln's Avengers: Justice, Revenge, and Reunion after the Civil War, (W.W. Norton, 2005). J. Steers, Edward, His Name is Still Mudd: The Case Against Doctor Samuel Alexander Mudd, (Thomas Publications, 1997). Turner, Thomas R., Beware the People Weeping: Public Opinion and the Assassination of Abraham Lincoln, ( (Louisiana State University Press, reprint edition 1991). Turner, Thomas R., The Assassination of Abraham Lincoln, (Krieger Publishing Co., 1999). Winik, Jay, April 1865: The Month That Saved America, (New York: HarperCollins Publishers, 2001). Winkler, H. Donald, Lincoln and Booth: More Light on the Conspiracy, (Cumberland House Publishing, 2003). Bishop, Jim, The Day Lincoln was Shot, (Gramercy, 1984). Evans, C. Wyatt, The Legend of John Wilkes Booth: Myth, Memory, and a Mummy, (University of Kansas Press, 2004). Lewis, Lloyd, The Assassination of Abraham Lincoln: History and Myth, (University of Nebraska Press, 1994). Reck, W. Emerson, A. Lincoln: His Last 24 Hours, (University of South Carolina Press, 1987). Dewitt, David Miller, The Judicial Murder of Mary E. Surratt, (The Lawbook Exchange, Ltd, 2003). Grieve, Victoria, Ford's Theatre and the Lincoln Assassination, (Parks and History Association, 2001). Olson, Kay Melchisedech, The Assassination of Abraham Lincoln, (Capstone Press, 2005). Steers, Edward J., Blood on the Moon: The Assassination of Abraham Lincoln, (University Press of Kentucky, 2001). Steers, Edward, The Trial: The Assassination of President Lincoln and the Trial of the Conspirators, (University Press of Kentucky, 2003). Particular attention has been paid to the innocence or guilt of Mary Surratt, at whose boarding house many conspiracy meetings were held, and Dr. Samuel A. Mudd, who treated Booth’s broken leg during his escape attempt. Political historian Michael W. Kaufman focuses specifically on Lincoln’s assassin, John Wilkes Booth, in American Brutus. Kaufman narrates the activities of Booth, his co-conspirators and the President, who had agreed to attend a performance of “An American Cousin” at Ford’s Theater on Good Friday. There were plenty of reasons not to go -including the refusal of the intended guest of honor, Ulysses S. Grant, to attend. Soldiers, doctors and theater personnel descended on the presidential box after Booth leaped from it to the theater stage and escaped. It was decided to move the dying President across the street to a rooming house. There was plenty of off-stage drama at Petersen House where high ranking officials assembled over the next few hours and the official investigation was organized. James Tanner, a clerk in the War Department who had learned shorthand after he lost in his from a war injury, was attending the theater at Grover’s that night. Tanner, who lost both feet at the Second Battle of Bull Run, lived next door and was recruited to transcribe Secretary of War Edwin M. Stanton’s orders. He finished transcribing his notes shortly before President Lincoln died “and passed back into the room where the president lay. There were gathered all those whose names I have mentioned and many others – about twenty-or twenty-five in all, I should judge. The bed had been pulled out from the corner and owing to the stature of Mr. Lincoln, he lay diagonally on his back. He had been utterly unconscious from the instant the bullet plowed into his brain. His stertorous breathing subsided a couple of minutes after seven o’clock. From then to the end only the gentle rise and fall of his bosom gave indication that life remained. The surgeon general was near the head of the bed, sometimes sitting on the edge thereof, his finger on the pulse of the dying man. Occasionally he put his ear down to catch the lessening beats of heart. Mr. Lincoln’s pastor. The Reverend Doctor Gurley, stood a little to the left of the bed. Mr. Stanton sat in a chair near the foot on the left, where the pictures place Andrew Johnson. I stood quite near the head of the bed and from that position had full view of Mr. Stanton across the president’s body. At my right Robert Lincoln sobbed on the shoulder of Charles Sumner. Stanton’s gaze was fixed intently on the countenance of his dying chief. He had, as I said, been a man of steel throughout the night but as I looked at his face across the corner of the bed and saw the twitching of the muscles I knew that it was only by a powerful effort that he restrained himself. The rest of Kaufman’s book meticulously details Booth’s complicated escape from the city and death after Union soldiers surrounded him in a barn they set afire. It ends with the trial and execution of the alleged co-conspirators. Kaufman is much more equivocal about the guilt of Dr. Samuel Mudd than some other recent assassination authors – especially Edwin A. Steers, who believes that Mudd was clearly implicated in the murder conspiracy. Michael Kaufman is a political historian. H. Donald Winkler, The Women in Lincoln’s Life, p. 220. Michael W. Kaufman, American Brutus: John Wilkes Booth and the Lincoln Conspiracies, p. xiv. Michael W. Kaufman, American Brutus: John Wilkes Booth and the Lincoln Conspiracies, p. xiii,245. Michael W. Kauffman, American Brutus: John Wilkes Booth and the Lincoln Conspiracies, pp. 245-246. Smith Stimmel, Personal Reminiscences of Abraham Lincoln, pp. 89-90. Michael W. Kauffman, American Brutus: John Wilkes Booth and the Lincoln Conspiracies, p. 393. William Barton, The Life of Abraham Lincoln, Volume II, p. 479. Michael W. Kauffman, American Brutus: John Wilkes Booth and the Lincoln Conspiracies, p. 79. Michael W. Kauffman, American Brutus: John Wilkes Booth and the Lincoln Conspiracies, p. 240.